On November 12, 1966, during the Gemini 12 mission EVA 1 (Extravehicular activity), NASA astronaut Edwin “Buzz” Aldrin took his own self-portrait with his camera with our beautiful Earth in the background. This historic photo is widely regarded as the “first space selfie”. The first “space selfie”. The full-resolution of this photo can be found at United States National Archives with the identity number of 5807070. Gemini 12 (officially Gemini XII) was a 1966 manned spaceflight in NASA’s Project Gemini (1961-1966), which was NASA’s second human spaceflight program. Conducted between projects Mercury and Apollo. Gemini XII was the 10th and final manned Gemini flight, the 18th manned American spaceflight, and the 26th spaceflight of all time, including X-15 (an experimented hypersonic rocket-powered aircraft) flights over 100 kilometers (54 nautical miles). Commanded by Gemini VII veteran James A. Lovell, the flight featured three periods of extravehicular activity (EVA)Notes 1 by rookie Edwin “Buzz” Aldrin, lasting a total of 5 hours and 30 minutes, which was a record-breaker at the time. Gemini 12 was designed to perform rendezvous and docking with the Agena target vehicle, an unmanned spacecraft used by NASA during its Gemini program to develop and practice orbital space rendezvous and docking techniques, and to perform large orbital changes, in preparation for the Apollo program lunar missions. Aldrin would later be one of the first two humans to land and walk on the Moon. He set foot on the Moon at 03:15:16 on July 21, 1969 (UTC), 9 minutes after Neil Armstrong (August 5, 1930 – August 25, 2012) first touched the surface. 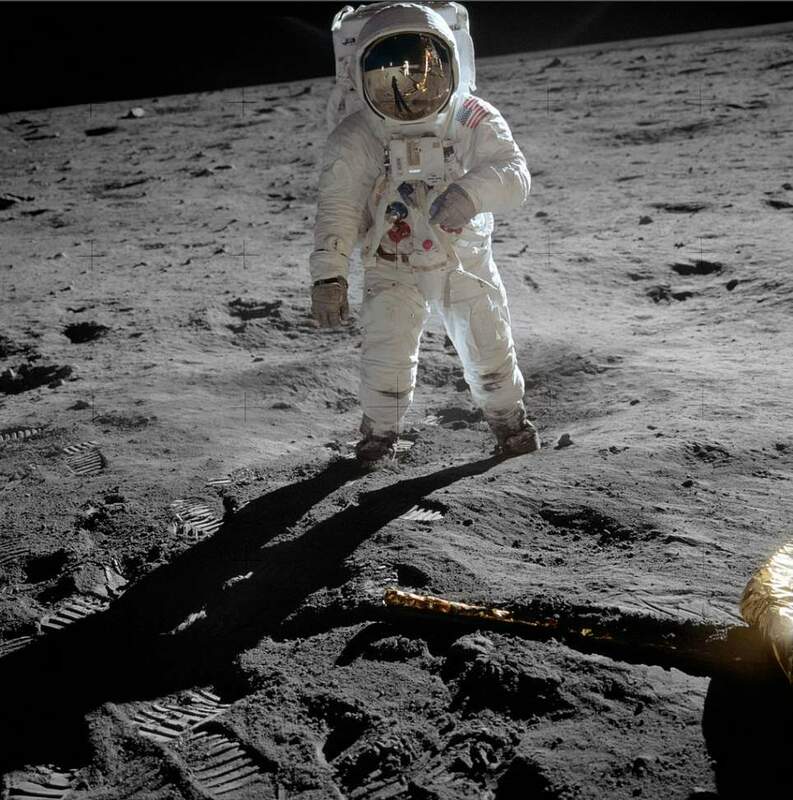 Moon Landing: Astronaut Buzz Aldrin, lunar module pilot, stands on the surface of the moon near the leg of the lunar module, Eagle, during the Apollo 11 moonwalk. Astronaut Neil Armstrong, mission commander, took this photograph with a 70mm lunar surface camera. This can be also regarded as a “selfie” as Armstrong’s image reflected back in Aldrin’s helmet visor. While Armstrong and Aldrin descended in the lunar module to explore the Sea of Tranquility, astronaut Michael Collins, command module pilot, remained in lunar orbit with the Command and Service Module, Columbia. This is the actual photograph as exposed on the moon by Armstrong. He held the camera slightly rotated so that the camera frame did not include the top of Aldrin’s portable life support system (“backpack”). A communications antenna mounted on top of the backpack is also cut off in this picture. When the image was released to the public, it was rotated clockwise to restore the astronaut to vertical for a more harmonious composition, and a black area was added above his head to recreate the missing black lunar “sky”. The edited version is the one most commonly reproduced and known to the public, but the original version, above, is the authentic exposure. This image was cataloged by NASA Headquarters of the United States National Aeronautics and Space Administration (NASA) under Photo ID: AS11-40-5903. Extravehicular activity (EVA), also called “spacewalking” is any activity done by an astronaut or cosmonaut outside a spacecraft beyond the Earth’s appreciable atmosphere.